Retained austenite in microstructure of TRIP-aided steel plays an important role and governs its performance. 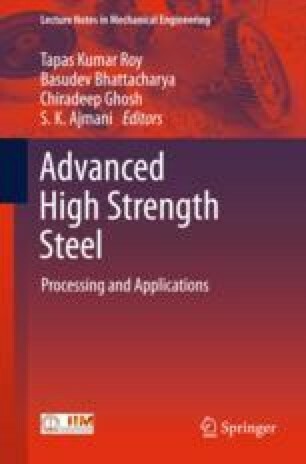 In the present paper, the microstructure and mechanical properties of some experimental TRIP-aided steels have been discussed. Prediction of the amount of retained austenite in the final microstructure has been done using mathematical models based on (a) artificial neural network (ANN) technique and (b) the theory of bainite transformation. The microstructure and mechanical properties of the experimental TRIP-aided steels have been studied and an attempt has been made to establish a correlation between the two. Promising results on microstructure and strength–ductility combinations along with reasonably enhanced coatability were obtained on laboratory samples.